EP Equipment offers a large variety of electric pallet stackers suitable for every application. Electric pallet stackers are also often called lifters or pallet jacks. Their main purpose is to safely lift, move, and stack pallets. Pallet stackers are often required for smaller tasks where a full-sized forklift perhaps couldn’t fit or would be too costly. 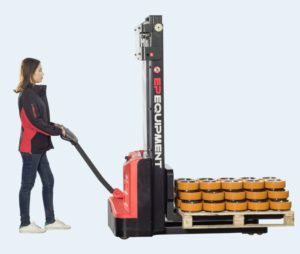 HOW TO BUY THE RIGHT ELECTRIC PALLET STACKER? There are many things that must be considered when choosing the right electric stacker for your application and mistakes made when trying to select the right piece of equipment can be extremely costly and could potentially put the user at risk. For these reasons we highly recommend getting in touch with an experienced distributor who will be able to walk you through the process from start to finish, ensuring everything is a perfect match for your operational needs.